Photographer Liz LaBianca combines a Nikon d750 and PicTapGo to make this ethereal and calming series of underwater images. For a more in-depth tutorial on combining wifi-enabled cameras and PicTapGo, visit Paul Gero's post here. I have loved photography since I was a kid. I remember sitting in a sea of black and white images while my grandmother told me the stories behind them. In College, I took a Photography class taught by a professor who focused on still life - which I did not love - so I thought maybe photography wasn't for me. Fast forward to when I had my son and I shot my little heart out on my Nikon D40 - on Automatic. I buckled down and taught myself anything and everything I could. My camera was around my neck 24/7 and everyday I would learn something new. It has been hard to blend a passion and running a business. I am so protective of my art and I never want to burn out. I am almost 5 years in and I feel like I have finally figured out how to balance my passion for motherhood and my passion for photography. I have a feeling this will be my best season yet. I love all things photography, but the passion changes when you are working for someone and I have had to learn how to get used to that. I always say that my dream would be traveling the world with my family. I love seeing different environments and finding the beauty in it. Seeing the world through their eyes. Overall, children are my absolute favorite subjects. Their view of the world is pure and untainted and there is so much beauty in that. What equipment are you using to make your underwater images? I finally buckled down and purchased an underwater housing unit for my Nikon d750. I use the SLP housing unit and, because I love the idea of different perspectives, I purchased ports for my fisheye (the best lens for underwater photography), 35 mm 1.4, 50 mm 1.4 and 85 mm 1.4. Can you tell us about what inspired you to embark on this series? Any challenges that you encountered? 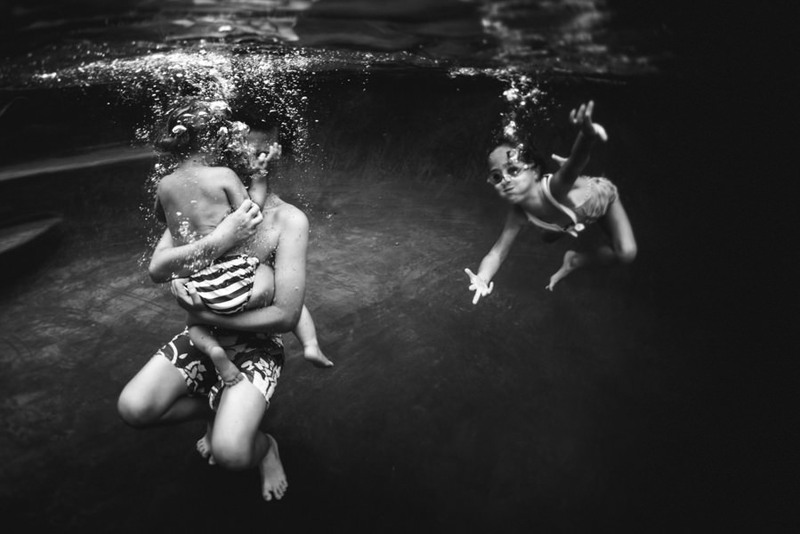 I don't ever think I thought of it as a series; I just have a little girl who loves to swim and, just for fun, I decided to see what her world looked like. Once I realized how much she smiled under the water, I couldn't stop going underwater with her. One of the main challenges was learning how my lenses worked under the water. Getting the correct settings and focusing systems that work with the way that I shoot. Life isn't serious - and shooting underwater isn't serious either - it's fun to look at what you captured while your kids were just being kids. I have really enjoy shooting at night this summer. Utilizing the underwater lighting provided such fun opportunities that never occurred to me before. I edit based on a feeling not a "recipe" per say. I shoot with my Nikon D750 95% of the time and, because it has wifi capability, I have really tried to limit my computer time to strictly client work and business stuff. I can send the images to my phone and then edit with PicTapGo, which allows me to post directly to Instagram. I love all the different editing options that help me to create something that maybe I wouldn't have created in Photoshop. A lot of times I need to step away from an image and come back with fresh eyes to put my finishing touches on it. I think editing is a feeling. I tell a lot of people who mentor with me that I can teach them what I do and teach them editing, but it is up to them to find their style.